While the rest of the West seems to have been wet, 11 of our pack had a most enjoyable DRY walk from Tipton St John sometimes by the river Otter, sometimes away, up to the outskirts of Ottery St Mary and then back south. 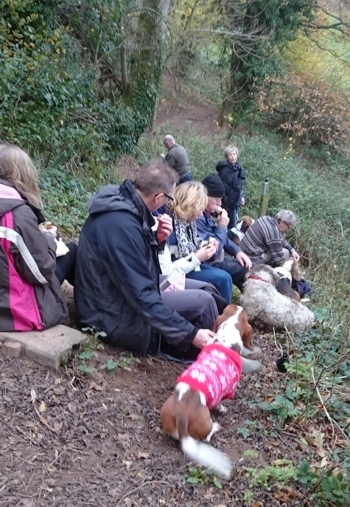 The start was enlivened by the Chief Photographer of the Sidmouth Herald attempting to take some pics helped by a keen dog (see video), but fighting him off we stepped out under the watchful eye of Our Leader Andrew, while his acolytes Gay and Caroline kept him in sight. It was particularly pleasing for me to bring along my Melody after her car collision 10 weeks ago that broke her leg in three places, and cost the driver's insurance the small matter of £3200. She certainly relished chasing everything in sight, in particular Beau a Griffon from near my home. She was so full of joie de vivre that crossing a bridge she unexpectedly flung herself off to belly flop in the water to the amazement of everyone else. Epic was vocal as usual and Jackie somehow struggled round burdened with a painful knee. (Don't worry, you're in the queue for a new one. Promise). 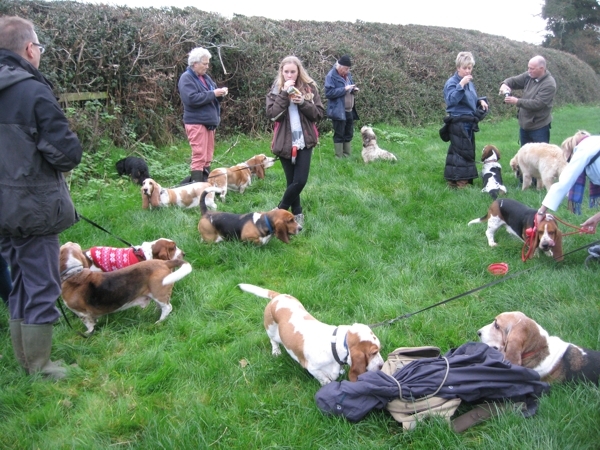 At the finish we were treated to a demo of the new EasiDri towel for wet hounds by Gay - and some wriggling Basset socks that somehow intruded into view. A merry Christmas to hounds everywhere.